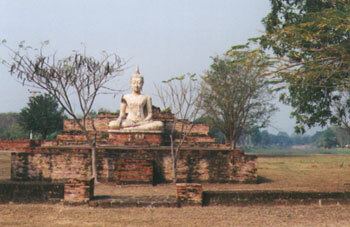 A Buddha sits amongst the ruins of the ancient Sukhothai Kingdom (mid 13th to 15th centuries), near Wat Phra Phai Luang. Buddha images are created according to strict iconographical rules dating back to the 3rd century. The seated Buddha, with right hand touching the ground, (bhumisparsa mudra) is the most common. It illustrates the moment when he sat in meditation under a Bodhi tree in Bodh Gaya, India, having vowed not to move from the spot until he had attained enlightenment. The Evil One, Mara, offered temptations and distractions ranging from nubile maidens, tempests, and floods. Buddha touched the ground to attract the Earth Goddess, so she could witness his resolve. The earth responded with a hundred thousand roars, "I bear you witness". He attained enlightenment shortly after, under a rain of red blossoms.